This next post had my mind digging deeply at 4 o'clock in the morning. It should have been easy to write about evacuation shelter items for a 72-hour kit, but I kept thinking of 101 worst-case scenarios. With the unusually cold weather across the U.S., sheltering-in-place at home would be your first choice after a disaster, but it isn't always possible. So, what would I use for shelter in our family emergency supplies? Tent - Over the years we've had little tents and huge tents. From the two-man tents left over from the Boy Scout days to the 8 man tent our family used while camping. I am lucky to have several to choose from. I chose to keep a medium-sized tent near our packs in our emergency closet. I can't carry it on my back, but I could throw it in the back of a vehicle. I'm also digging out a few two-man tents this week to add to the stash. A tent should provide privacy, warmth, be waterproof and lightweight. Most tents today are quick and easy to set up. The fact that I've never set up our tent all by myself is not comforting. I've always assisted others. So we will have to practice for family home evening. After a disaster, you may end up camping at a community center, church, park or field with a lot of other people, so privacy is important. Don't expect to find Red Cross volunteers waiting with a comfy cot with your name on it when you arrive. If possible, be self-sufficient and bring your own tent and other items. Tents are always on sale, but are the least expensive at the end of the summer. Tarp - In my 72-hour kit supplies, I have a blue tarp. It doesn't fit in a backpack, but I keep it in a 5 gallon bucket with other emergency supplies. I hope I never have to build a lean-to with it, but . . . you never know. The tarp is for underneath the tent as an added barrier or to make a much needed outhouse or as a rain shelter. Look for one at Walmart or a hardware store. Make sure you have the right size. Rope - Some nylon rope is useful for all kinds of needs like tying things down or to a tree. Look for one at Walmart or a hardware store. Keep it simple. In closing, let's look at various scenarios. My husband heroically drives home in his noble white 4Runner to help us. I'm able to throw all my stuff in the back of our car and drive to a hotel. My house is inaccessible and I have to head who knows where on foot. I was driving in my car, had to pull over, and am stuck in traffic. Have to use what's stored in the car. Scary. I am with two neighborhood kids whose mom is at work, my two daughters and the dog and have to figure out how to calm, shelter and feed them. I have to live in a tent city for several months. 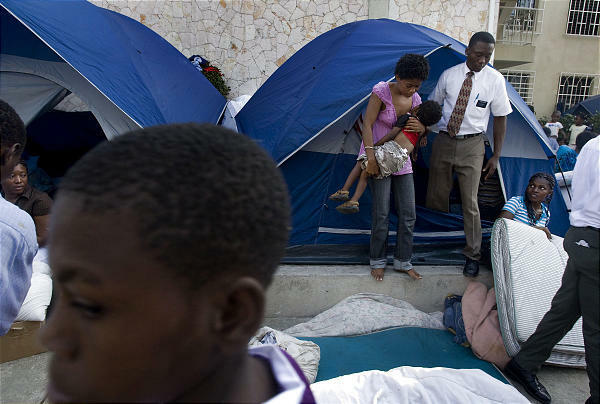 Check out 30 pictures at Deseret News: LDS Relief: Tent village surrounds Mormon meetinghouse in Haiti. I hope some of these ideas helped you. Good luck figuring out what you want to use for your emergency shelter. Prayer is to best resource. Will you be creating a post on Step 3, or any of the other steps? Thank you so much for your thoughts. You've given me a lot to think about with this one on shelter in particular. Yes, Lori. Sorry it's taking me so long, but yes. A bit of information on the rope.... 550 Paracord is a good, inexpensive (relatively) rope that has many functions (can be used as one rope, the center parts can be removed individually for smaller, thinner uses, etc) and is lightweight. In addition, with the cobra-weave pattern, you can take 1 foot of rope and "braid" it into 1 inch of pattern. For example, an 8 inch paracord bracelet is made from an 8 ft length of paracord. I have taken a 100ft rope and braided it into approx 8 ft of braided rope. Still usable in that form, I am able to use D-clips to attach other items to it through the weave, I have tied it around my pack to tie my sleeping bag to my backpack, so it is functional (not just taking up space) and is consolidated. These can be used as slings for guns, as leashes for pets, as collars for pets, etc, so it's an alternative way of carrying rope, without it just being a bundle of rope in your bag (taking up space you might be able to use elsewhere).